The current golden age of comic book television has been an exciting time for fans. Some of their favorite characters have come to life on shows like The Flash, Arrow, Gotham, The Walking Dead to name a few. For Latinos, it's also been a good platform to find representation. It's not a windfall of roles considering Latinos on television in general still only make up about 10% of all roles, but their inclusion in this trendy segment of programming is a small victory in a much bigger battle. Let's start with the stats that help understand the importance of Latino representation in a medium that virtually ignores them. Despite the fact that American Latinos makeup 17% of the population, consume more media (+17 hours of TV), and have more consumer buying power (1.5 trillion dollars), representation on mediums like television isn't much better that it was in the 1950's. So when a pop culture phenomenon like comic book adaptations in film and TV begin to include Latino actors (in Latino and non-Latino roles) it suddenly becomes a big deal. The roles may not be leading roles, but the progress is encouraging. Probably the most significant Latino role in comic book shows is Cisco Ramon of CW's hit 'The Flash.' Played by actor, musician, singer, composer of Colombian heritage, Carlos Valdes, Cisco provides technical support to Barry Allen (Grant Gustin) as well as adding some comedic relief. While he may not be the main hero, Cisco is a vital part of the STAR Labs team and is beginning to demonstrate some of the powers of his comic book namesake, Vibe. The role of Cisco has escaped the tropes associated with Latinos in supporting roles. He's not in a subordinate role, but an equal in intelligence and others rely on his expertise to make the Flash better. It plays more as an important piece of an ensemble than a sidekick. 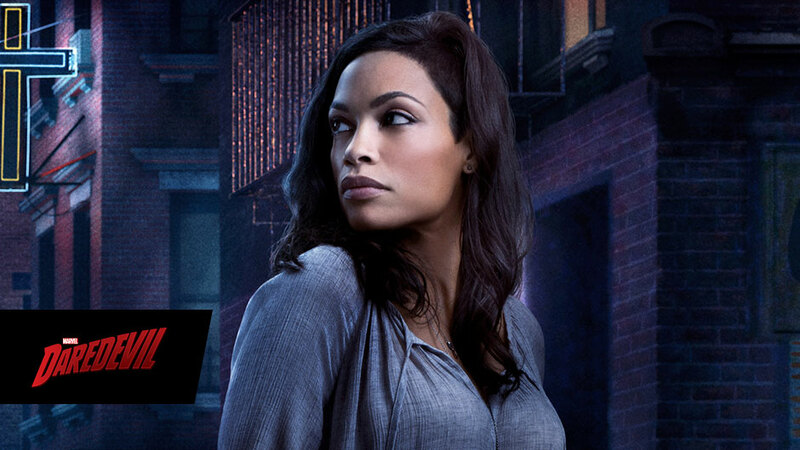 Fox's 'Gotham' has provided Latinas with multiple roles in this hit Batman prequel. Season one found Victoria Cartagena as Detective Renee Montoya and up until she was killed off early in season two, Zabryna Guevara played Commissioner Sarah Essen. Montoya was involved in an obsessive relationship with Barbara Kean (Erin Richards) but was seldom used on the series beyond that. In the comics, she had a much more significant role as a Gotham detective and later as a hero herself, The Question. As the show emphasized the villains in a more central role, some characters were eliminated including Montoya going into season two. Essen was the Captain and later Commissioner on the series that was written as the more stereotypical angry but reluctantly supportive administrator to Detectives Jim Gordon (Ben McKenzie) and Harvey Bullock (Donal Logue). She was killed off by the young Joker-like Jerome (Cameron Monaghan). So with two Latinas off the show, two more entered. Morena Baccarin became a series regular as Dr. Leslie Thompkins. She's the medical examiner of the GCPD but in season two has been the love interest and emotional support for Gordon. The Brazillian native has played the most upbeat and positive character amid a crazy and violent villain-heavy season two. Also, making her mark during season two is Michelle Veintimilla who's playing the first female iteration of the arsonist Firefly. The victim of abuse from her two step-brothers she befriends young Selina Kyle (Camren Bicondova) and embraces her freedom as a flame-throwing villain. It's a role the young actress has relished as she told Fox News. I think it was really empowering for me and I think for other women watching, and young girls especially, and Hispanic girls. I feel like I’m representing the Hispanic community as well. Veintimilla gets to bring this character to life with a fully realized arc from scared captive to empowered villain. Like Carlos Valdes, Ciara Renee comes from the Broadway stage and is a talented singer, musician, and dancer. She's a relative newcomer to television but is excited to be playing a superhero. She's playing Kendra Saunders aka Hawkgirl in the upcoming spin-off show for CW, Legends of Tomorrow. 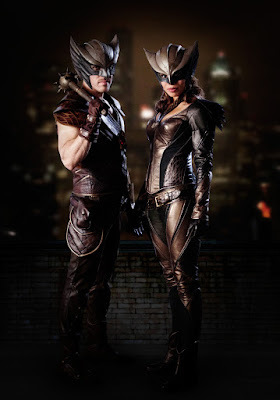 Renee has already made an appearance on 'The Flash' as Saunders, but impending episodes will establish her superhero persona who's been reincarnated repeatedly over centuries along with Carter Hall (Falk Hentschel) as Hawkman who together will harness the power of an ancient Egyptian god with super strength and wings. 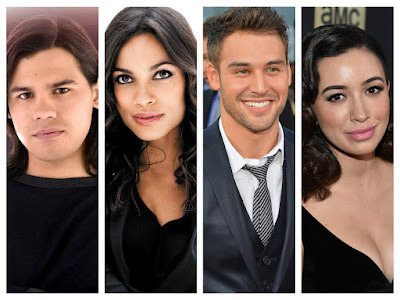 They'll join the super team on 'Legends of Tomorrow' at midseason with Brandon Routh (Arrow‘s Ray Palmer/The Atom), Wentworth Miller (The Flash‘s Leonard Snart/Captain Cold), Dominic Purcell (The Flash‘s Mick Rory/Heat Wave), Victor Garber (Dr. Martin Stein) and Caity Lotz (Arrow's Sara Lance/White Canary). 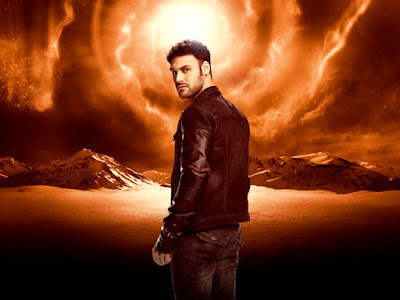 NBC's Heroes Reborn while not technically a comic book show is heavily influenced by comics since the show features people with super powers. It's also one of the most diverse casts on television. Ryan Guzman plays Carlos Gutierrez, a military vet who abstained from the family automotive repair business to find his own path. When his brother turns out to be an "evo" -an evolved human with powers - and is killed he picks up the mantle of El Vengador, a costumed vigilante despite not having any powers himself. He uses his smarts to create gadgets that help him fight the bad guys while trying to find the person responsible for his brother's murder. It takes him on a journey fraught with danger but finally finds his purpose in life. Guzman's star began to rise after Step Up: Revolution, his run on Pretty Little Liars, and the steamy thriller with Jennifer Lopez The Boy Next Door. The Mexican-American actor, dancer, model and former MMA competitor is redefining the modern renaissance man. When it comes to ratings, The Walking Dead is the 300-pound gorilla of comic book shows (or shows period). In its six years on the air, the show based on the Image Comics series from Robert Kirkman, Tony Moore, and Charlie Adlard, has become a cultural phenomenon. The post-apocalyptic zombie-infested drama has captured the imaginations of millions of loyal viewers. 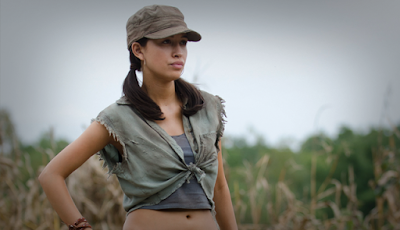 As Rosita Espinoza, Christian Serratos has been a vital supporting character helping to keep their band of survivors alive amid the flesh-hungry zombies or worse - other survivors. The Southern California native is like a lot of the actors on this list with multiple talents. Serratos is an actor, dancer, and a former competitive ice-skater. Serratos may not be a frontline player on The Walking Dead but she gives us a little hope that some Latinos will survive a zombie apocalypse. I just wished we'd see more of them. Rosario Dawson is no stranger to audiences as she's been a working actress since her debut in 1995 as Ruby in the edgy New York slice-of-life feature 'Kids.' Her career has fluctuated from supporting to leading roles making her one of the busiest Latina actors in the business. It's worth noting that 'Daredevil' featured storylines involving Latino and Asian characters who spoke in their native languages were addressed by the Caucasian leads in the same language. Usually, a minor character is introduced to serve as an interpreter for the leads, rarely is the lead fluent in a second language. Dawson provided some star power and served as the audience's surrogate who was witness to some incredible super heroics. When she appears on 'Luke Cage' she'll be joined by Emmy and 3-time Golden Globe nominated Brazilian actress Sonia Braga who'll play her mother. Dawson has also appeared on other comic book-based productions like 'Frank Miller's Sin City' and its sequel and multiple voice work for animated shows and movies like 'Justice League: Throne of Atlantis' as Wonder Woman. The Netflix Marvel universe has done a better job of representing Latinos than their broadcast network brethren. 'Agents of SHIELD' on ABC has had a rocky existence since it debuted in 2013 but benefits greatly from the 'Marvel' brand and from being on a broadcast network. To its credit, 'Agents' features lead actors Ming-Na Wen as skilled Agent Melinda May and Chloe Bennet as superpowered "inhuman" Agent Daisy Johnson who both are of Asian descent. 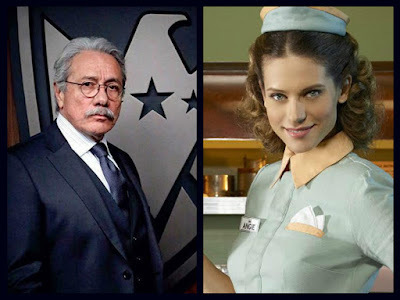 As far as Latinos go, there's only been one guest spot by a man struggling with his new powers, another guest spot from Agent Jasper Sitwell (Maximiliano Hernandez) from the MCU, and a short arc featuring legendary actor Edward James Olmos as the Commander of the "real SHIELD," whatever that means. On the great spy adventure series 'Agent Carter,' Hayley Atwell plays Peggy Carter who is constantly undermined and underestimated but overcomes those obstacles with steely determination and sheer talent. Joined on her first season on ABC, Peggy found a friend in waitress/aspiring actress Angie Martinelli played by Oakland-native and of Portuguese descent Lindsy Fonseca. She appeared in 6 episodes and provided someone she could confide in without giving away her identity as an agent. Angie was friendly, perky, and provided a sympathetic ear for Peggy. Were these roles inconsequential? Were they mere window dressing? No, but they were temporary. They did move the plot along and were small storytelling cogs in these shows, but there isn't a regular cast member that is Latino. Will there be one when season two of 'Agent Carter' heads to 1940's Los Angeles? 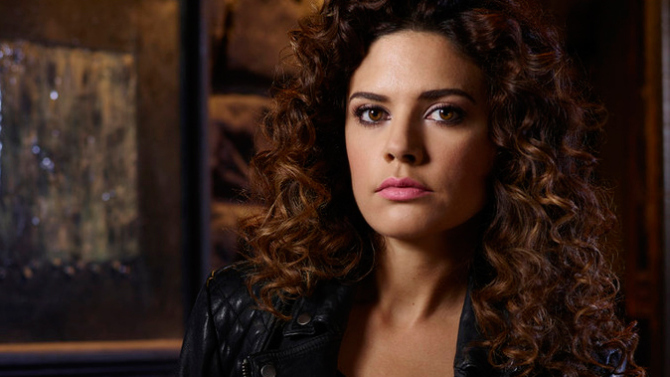 The criminally shortened then canceled 'Constantine' on NBC featured Angelica Celaya as Zed, assistant to Matt Ryan's titular character, who played a great ally to the supernatural detective. She appeared in all but two episodes of the 13-episode season. She occasionally spoke Spanish on the show. The Hispanic population is expected to grow by 86% from 2015 to 2050. It's inevitable that an industry like television will catch up to the emerging audience whether by choice or as more Latinos make inroads into executive positions. However, with all the different ways people consume entertainment can TV afford to ignore its most fervent viewers for long? Latinos are moving away from roles of cops, criminals, and domestic workers and are part of television's hottest genre. Will we see comic book characters like Jaime Reyes, Jessica Cruz, America Chavez, Miles Morales, and Angela Del Toro soon on the small screen? 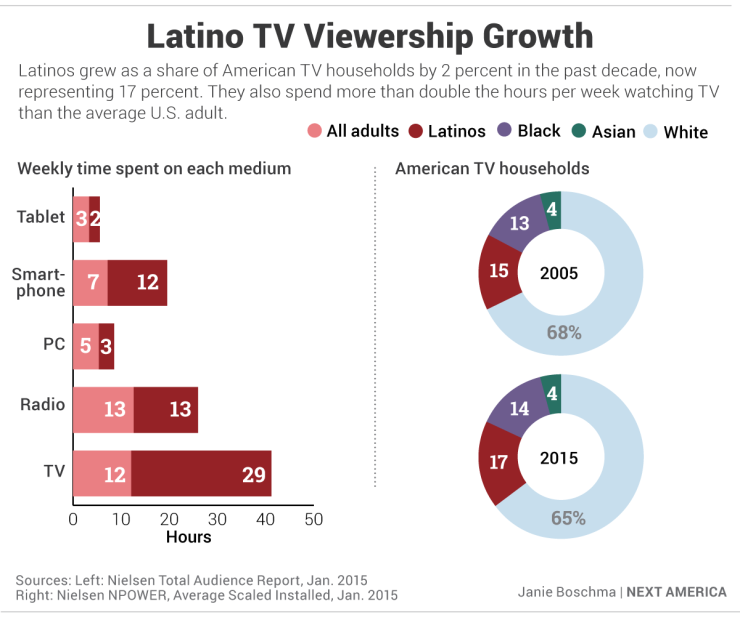 Perhaps, because right now it may be the only way to see Latinos on television.